Many shower remodeling projects begin with the challenge of how to creatively “find” space without the cost or expense of having to gut the area and try to “take” square footage from an adjoining room. This challenge is exactly what Cleveland Design & Remodeling encountered in a recent shower remodel in the Northeast Ohio suburb of Broadview Hts where the owners not only needed more area – but improved accessibility for a family member with special needs. Learn below how these problems were solved to create not only a high functioning space, but one that added style as well. 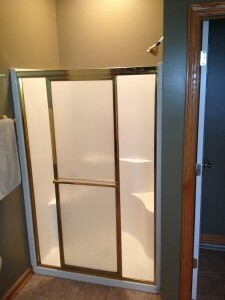 The existing 32 x 48 fiberglass shower enclosure was not big enough – The current shower stall was not only small but it also had a seat integrated into the one piece unit that took up significant room. This made it difficult for the care giver to get into the area with the special needs child. 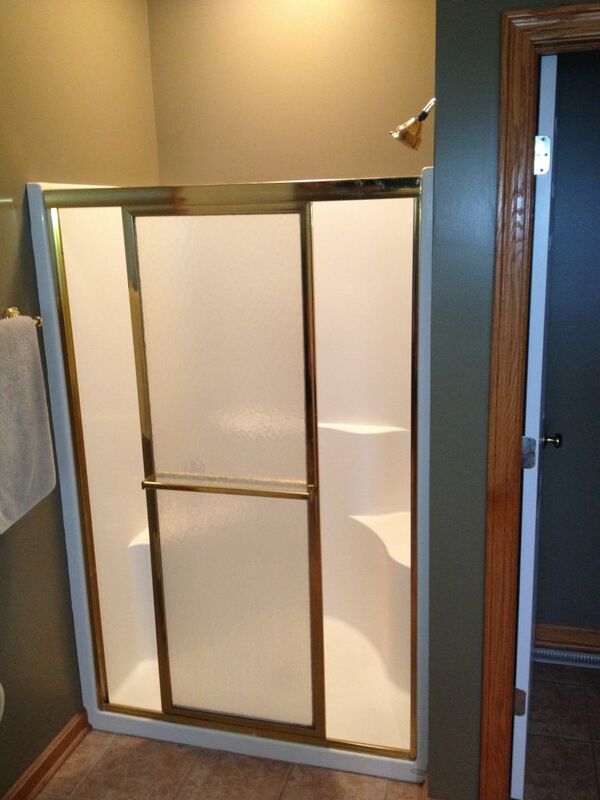 The entry space was tight and the finish on the shower door was outdated – The sliding glass door provided a small entry area and the bright brass look of the door was outdated. A toilet room next to the shower confined the shower design possibilities – Since the goal in this remodel was to leave the toilet room adjacent to the shower in tact (and minimize major structural changes) the redesign approach was more limited. JeffMerrell(Project Specialist) andSteve Vlk(Project Manager) came up with the following design, product and construction solutions. Improving safety & ease of use – To create a safe shower the most important thing done was to make the shower bigger (by adding depth) and to create a walk in accessible entry by eliminating the door. 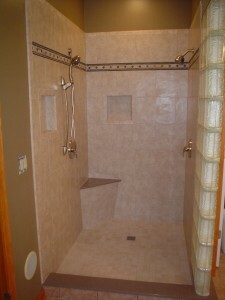 In addition a small 18” wide glass block shower wall was put in for stability and style. Steve (the Project manager) also added 2” x 12” wood backing through the middle of the shower to provide stability for grab bars that might be mounted to the tile walls in the future. A Nutone light and exhaust fan was used to reduce humidity and provide light inside the shower. A corner bench seat and hand held shower were installed to allow showering while sitting down. Creating a long lasting functional shower – There are many options in shower bases and walls but many cheaper options (like fiberglass) tend to not last long and don’t look very nice. 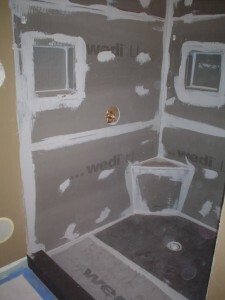 To make a shower that would withstand the rigors of a wet space for years to come a wedi waterproof shower was chosen. This system is made of extruded polystyrene and provides the flexibility to create a custom size on site using 3’ x 5’ wall panels and “fundo” shower base (which is presloped to ensure the water moves properly). This system comes with pre-formed niches (16” x 16” in size) that were recessed into the wall to make it safer (eliminating soap and shampoo bottles on the shower floor). Adding style – To add luxury 8” x 10” larger tiles where chosen to minimize grout joints and add the feeling of a larger space. An 18” x 80” Icscapes pattern glass block shower added a decorative touch to increase the depth of the shower. The glass block is easy to clean with virtually no maintenance and does not show spotting. A brushed nickel shower head with an anti-scald valve where also used. 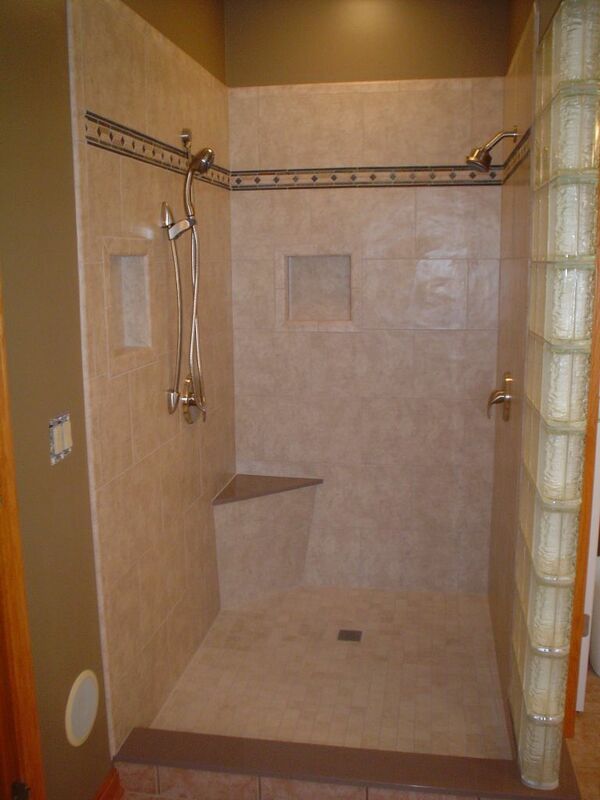 What do you think about this shower remodeling project? Do you have any questions we can answer? Please comment below. Learn more about doing a shower remodel by visiting or calling Cleveland Design & Remodeling (216-658-1270)or The Bath Doctor of Columbus (614-252-7294) or Cleveland (216-531-6085).